The last few days we visited the different South Catalonia trial sites for the FTI project. Among the visits we saw a previous experiment of April 2015 where we planted almonds with Cocoons. 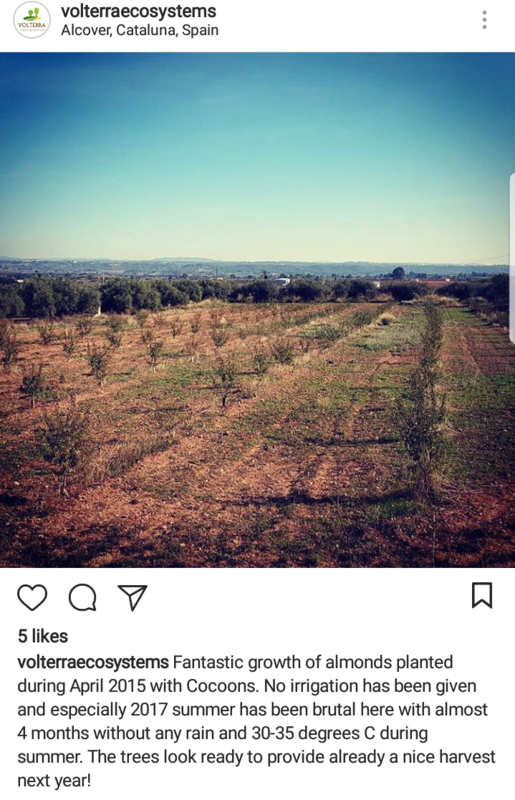 We saw fantastic growth of these almonds. No irrigation nor fertiliser has been given and especially 2017 summer has been brutal here with almost 4 months without any rain and 30-35 degrees C during summer. The trees look ready to provide already a nice harvest next year! This entry was posted in News and tagged Catalonia, Cocoon, Monitoring, Spain. Bookmark the permalink.